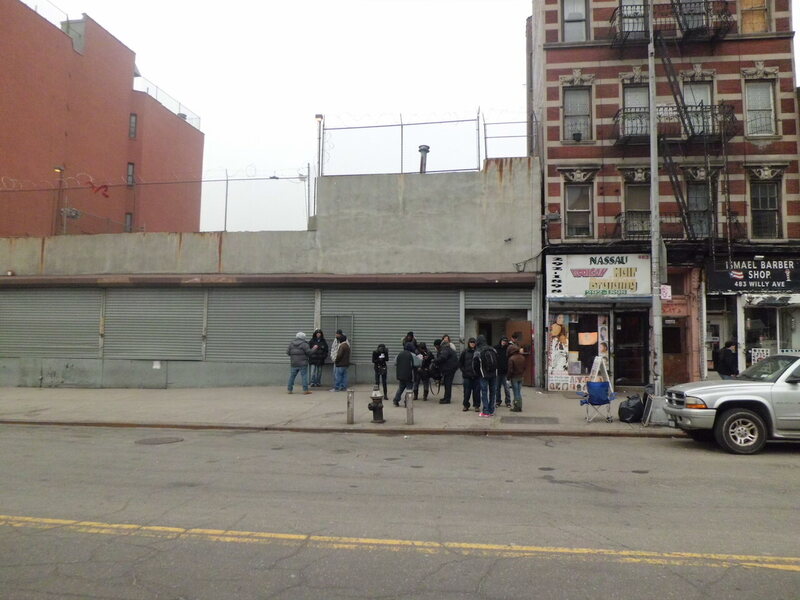 Patients waited to be let into the Narco Freedom clinic on Willis Ave. in March. Narco Freedom, the nonprofit that runs clinics and temporary housing for recovering drug users in Mott Haven, is expected to run out of money on Sept. 21, leaving more questions than answers for clients who depend on its services, and for neighborhood residents who have long complained that the presence of loitering patients from the clinics diminishes the local quality of life. After Narco Freedom’s CEO and other executives were indicted for fraud in March following a lengthy investigation, the court appointed a lawyer, Lori Lapin Jones, to temporarily run the organization. Jones has been leading negotiations with the state, city and other organizations to provide services for Narco Freedom’s patients and housing for its approximately 800 residents. In all, Narco Freedom runs 15 clinics, 18 three-quarter houses and three residential facilities for people with HIV/AIDS citywide. The group employs about 500 workers in the Bronx. Although Jones would not comment for this story, papers filed in federal court on August 24 indicate that a plan calls for closing all of Narco Freedom’s Queens facilities and using two large healthcare providers to service patients elsewhere, including Mott Haven. Samaritan Village would take over its Manhattan facilities and all but two in the Bronx. The Bronx-based Acacia Network would take over the other two Bronx facilities and all of Narco Freedom’s Brooklyn services. “It’s a change that’s detrimental for everybody, the workers and us, because all new things are happening and no one really knows what’s going on,” said Ali Austin, a resident in one of the Brooklyn facilities and an organizer for the grassroots Three-Quarter House Tenant Organizing Project. Three-quarter houses, also known as Freedom Houses, were established as temporary housing for people who are homeless, mentally ill or substance abusers. Conditions are notoriously cramped and buildings are often infested with bed bugs. Additionally, critics of the practice say that drugs are readily available in three-quarter houses and violence is common. Ten of Narco Freedom’s three-quarter houses are located in the Bronx, many of them in Mott Haven and Melrose. The Bronx district attorney’s office said that one recent death and at least one assault are currently under investigation in the local buildings. The city launched a task force in June to address the problems, but improvements so far have been meager, Austin said. One notable change for Narco Freedom residents has been the addition of air conditioners, as the result of a tenant organizing campaign, he said. Although conditions are bleak, most residents have nowhere else to go. Under the former leadership, residents were obligated to attend substance abuse treatment sessions as a condition of occupancy, even when the sessions were not clinically necessary, according to the attorney general’s office. The group then billed Medicaid for those unneeded sessions, helping the former CEO and his son lead lavish lifestyles with fancy cars and Long Island mansions, according to the indictment. The state’s Office of Alcoholism and Substance Abuse Services recently classified the group’s 18 Freedom Houses as “supportive living residences” for 120 days, which entitles residents to receive a higher monthly housing stipend. In turn, those additional funds are being used to help pay the program’s debts. But even with that added revenue, Narco Freedom is running deep in the red, according to the court documents. Some residents and advocates are concerned that those who are in the program for reasons other than substance abuse may be cut off and left homeless if the supportive living classification becomes permanent. According to an August 7 letter sent by the city’s law department to the federal judge overseeing the transition process, Narco Freedom residents could receive stipends from the Human Resources Administration to help them find housing. Though an HRA spokesman declined to comment on that issue, he said the agency is aware of the sensitive transitional period and is poised to help residents avoid being left homeless. In the court papers, the court-appointed receiver recognized the risks for residents. While housing remains a concern, it appears rehabilitation services will not be affected. All but one of Narco Freedom’s Bronx and Brooklyn clinics will remain open to provide chemical dependence, methadone, mental health and primary care services. A representative from health care union 1199 SEIU confirmed that employees at one Brooklyn clinic are negotiating to continue working once Acacia takes over. The fate of all other employees, including those in the Bronx, is still unclear. All Narco Freedom workers have been served with termination notices stating that their employment will be over, effective September 21. Samaritan Village and Acacia did not reply to requests for comment. A status conference has been scheduled on Sept. 11 at the federal courthouse in Manhattan.